The device will be available in two distinct models, the Gear S2 and Gear S2 classic, the latter of which features a design language familiar to traditional watch owners. The standout feature for both versions is a 1.2-inch circular Super AMOLED display touting a 360 pixel-by-360 pixel resolution, packing in 302 pixels per inch. Like the Moto 360, Samsung developed a custom user interface based on its Tizen platform to take advantage of the round display. Of note, users will be able to navigate apps and system menus using a rotating bezel mechanism along with physical pushbuttons for home and back commands. A dual-core SoC clocked at 1.0 GHz powers the Gear S2, while other hardware niceties include 4GB of onboard storage, 512MB of RAM, an option to connect to 3G networks via e-SIM, Wi-Fi 802.11 b/g/n and NFC. Samsung expects the device to last anywhere from two to three days on a single charge from the included wireless charger. Taking a cue from Apple, Samsung built a suite of fitness capabilities into its latest wearable device, including a heart rate monitor and a 24-hour activity log tied into a notifications system to help keep users motivated. Connectivity with Samsung's proprietary S Health software is augmented by support for Nike+ Running. On the software side, Samsung offers up its usual selection of "S" apps, including support for the upcoming Samsung Pay mobile payments platform. 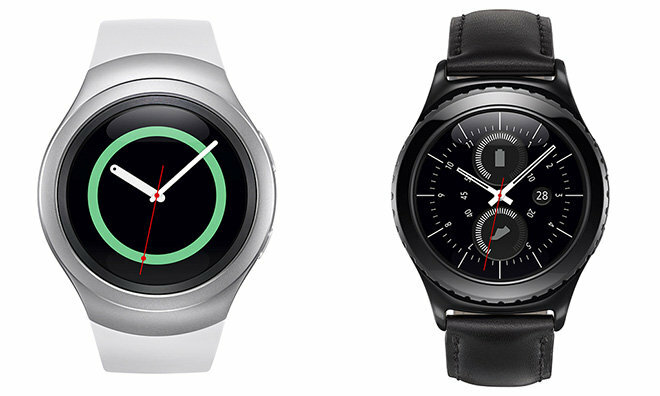 Samsung has yet to set a price or release date for Gear S2, but promises more information soon.